I had been fascinated since long time to stay in a tent. I realized this dream on my trek to Nag Tibba and Beas Kund. Most of us have realized this camping dream at various locations. However, where do we go ahead of that – sleeping in open, in a shack, in a hut, cottage? 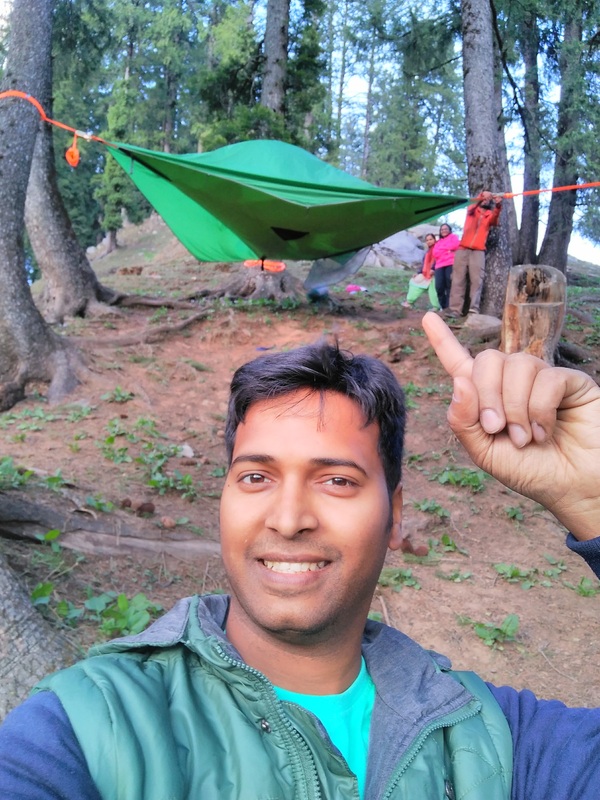 While I had not dreamt this far and was focused on planning for my family’s next mountain trip, my friend Sukrit Gupta told me about this fantastic experience of staying in a mid-air tent. 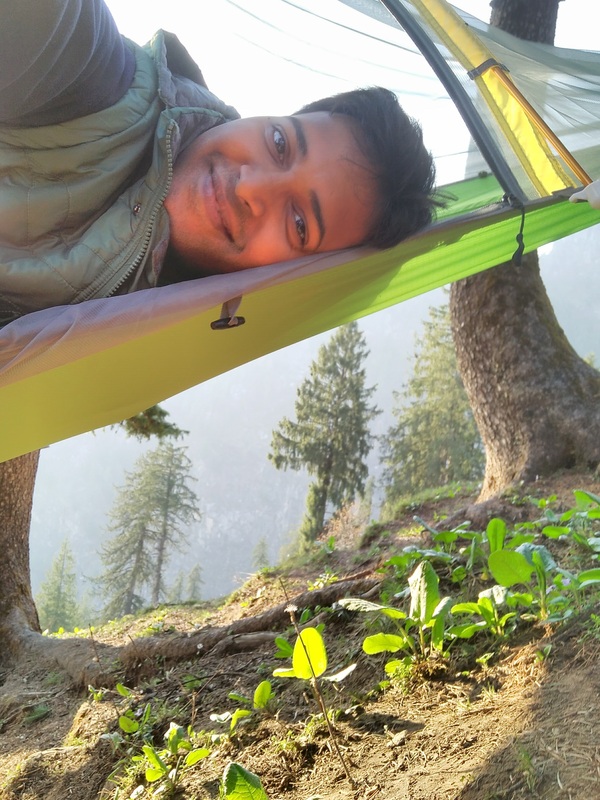 This tent is operated by this truly crazy man – Huzefa Siamwala. His story and background is as crazy as his name sounds (no judgements please before you know him!). Check out the Green tent at a distance tied to the trees! How I reached this tent? From Manali, We took the road towards Naggar (or you can directly take the road to Naggar from Kullu). There, we picked Huzefa, and he guided us further. A road to the left took us into the private estate of AD Hydro Power. With permit of Vikas (Backwoods Mountain Stay), we entered, and from there it was 12 km of unpaved highly bumpy (f******) road taking us from 6000 feet to 8500 feet directly It took us 30 minutes to reach there. We all were fed up of this unending road, waiting for it to end. After reaching up, it was a highly unexpected scenery with sylvan beauty, green valley, lots of sheeps grazing, a lonely house with billowing smoke, few mountain villagers in the house. It became cold as we reached there at about 4 pm. 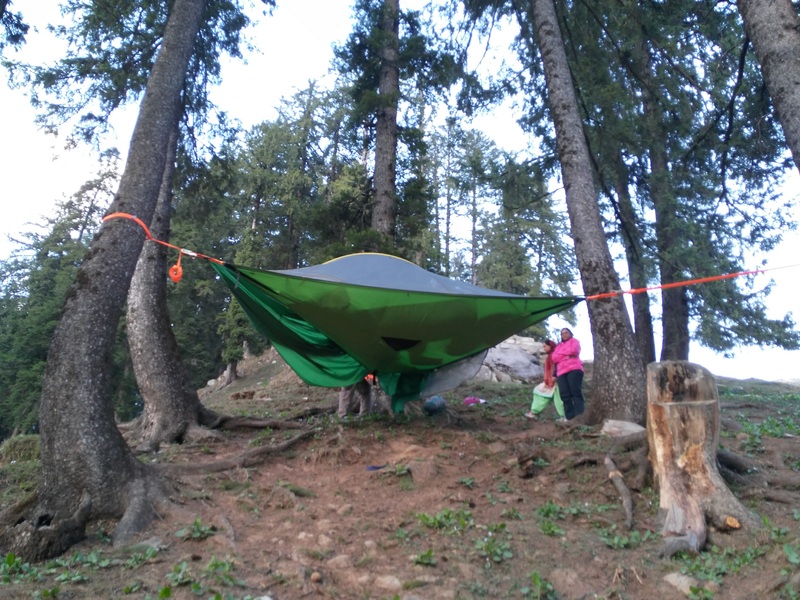 After having tea, Huzefa asked us to check out the green tent which we could see from a distance. My wife and mother were highly apprehensive about spending a night there. The reluctance was natural, but very high. There was no support nearby this tent in the jungle (woods). Thats how slopey it was! Huzefa gave us a demo of the tent, exhibited its strength by jumping into it, and then shaking it as much as possible. This gave all of us some confidence. After clicking some photos with my wife & still reluctant mother, we came back to the villager’s hut/ cafe/ dhaba and had tea again, and chatted up with few fellow travelers. As night grew, we had dinner inside the cafe/ dhaba run by the villager. They were so friendly and definitely not commercial-minded, just like all the mountain people. After dinner, we had bonfire in the chilling wind in that wilderness. We started prepping to spend the night in the tent. Woollens – check, hot water – check, torches – check. Thankfully, she had spare set of woollen clothes which she changed into. Adventurously and surprisingly she prepared her mind and we went back to the tent successfully. We climbed onto the tent with a bit difficulty, adjusted our mats & sleeping bags (oh! that was also a first for them) in that shaky tent with no stiff bottom. Every now and then we were sliding onto a slide. With some struggle, we managed to lie down in triangular positions as suggested. Our stuff was hanging down from the tent with a carabiner. … Now came the toughest part. For someone who has never been into wilderness – spending the life’s first night without enough day time to get comfortable, can be mentally lethal and quite fearsome. With no hope around in case anything happens, it was worrisome for me as well. We started chatting – anything & everything just to keep us engaged. Wind did a re-sounding job. Continuous wind hitting the tent, swaying it constantly and creating sounds in deep woods at 8500 feet. Constant reassurance was my only job. Sleep came very late into the night, but not before scaring all of us – THEM, because it was their first wilderness experience; ME, because I was worried about them. Finally, I could relieve myself after they slept. 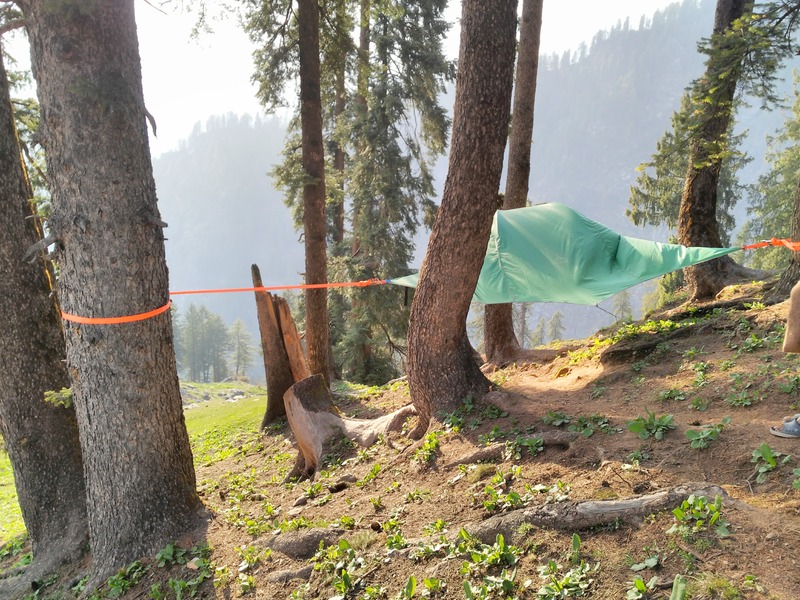 The tent was warm, sleeping bags provided by Huzefa were made for a temperature of upto ‘-10’ degree and protected us extremely well from the cold at 8500 feet. Nature did not call at all. The morning came early, with sun rays sieved by trees providing us a never-before morning scene. This adventurous night was worth it for the novices. Posted in Adventure, Couple Holiday, Travel, travel, adventure, UncategorizedTagged 8500 feet, backwoods, camp, hamta, huzefa, india's first, manali, mid-air, nature's call, panic, sethan, siamwala, slope, space, tent, water stream, wildernessBookmark the permalink.